Joseph Gordon-Levitt and Seth Rogen team up to beat the odds in a film that Rolling Stone calls "achingly hilarious and heartfelt". Diagnosed with spinal cancer, 27 year old Adam (Joseph Gordon-Levitt) navigates the road to recovery with the sometimes overbearing support of his crude best friend (Rogen), his smothering mother (Angelica Huston) and an inexperienced therapist (Anna Kendrick). Inspired by a true story of writer Will Reiser, 50/50 is an honest yet hysterically funny account of a young man's journey toward healing. $8.644 million on 2458 screens. Most films about cancer take a dark look at the subject, but 2011’s 50/50 opts for a more irreverent sensibility. 27-year-old Adam Learner (Joseph Gordon-Levitt) seems to have a good life, with a hot girlfriend named Rachael (Bryce Dallas Howard) and an enjoyable job at a public radio station. A rather neat ‘n’ tidy guy, Adam’s life gets thrown for a massive loop when he learns that he suffers from a malignant tumor on his spine. This sends him into a totally different mental place, as he needs to learn to adapt. We watch as Adam goes through his physical and emotional journey along with the support of best pal Kyle (Seth Rogen), mother Diane (Anjelica Huston), fellow chemo patients Mitch (Matt Frewer) and Alan (Philip Baker Hall) and neophyte therapist Katherine (Anna Kendrick). When I referred to 50/50 as “irreverent”, I may’ve overstated the manner in which it differs from the standard cancer movie. To be sure, it doesn’t indulge in the sense of mopey melodrama that normally affects this sort of work, but it also doesn’t deliver something unprecedented. We’ve seen “dramedies” like this in the past, though perhaps with less of a “bromance” emphasis. While 50/50 doesn’t reinvent any particular wheels, that doesn’t mean it fails to satisfy. Indeed, the film acts as a good contrast to the weepy material that tends to dominate the genre. It takes the subject seriously and doesn’t make Adam’s cancer a joke, but it refuses to become maudlin or sappy. That allows the film to feel more real. It probably helps that 50/50 comes based on writer Will Reiser’s experiences with cancer; I suspect the film is a loose adaptation of Reiser’s life, but the basic truth behind the fictionalization adds bite. Even if the entire movie had been invented, it still would succeed. We definitely get a nice melding of humor and drama. Neither tone ever really dominates, and they mesh in a natural manner; the jokes never feel forced, and the drama/emotion seems earned. The actors add spark to the material. I’m a little surprised to see Howard in another “villain role” so soon after The Help but at least she brings a little more humanity and sympathy to the part than otherwise might’ve been the case. Kendrick proves convincing as the therapist/potential love interest, and Rogen – essentially playing himself – offers his usual shtick. That’s fine, as he provides a nice contract to Adam and contributes the movie’s funniest moments. Gordon-Levitt carries the film and acts as possibly its biggest catalyst to success. Obviously Adam becomes the most three-dimensional role, and he’s the character that goes through the biggest changes, both physical and emotional. Gordon-Levitt proves his mettle as one of his generation’s most versatile actors with this convincing, powerful turn. Some parts of the story feel hackneyed – especially when the inevitable apparent romantic connection between Adam and Katherine emerges – but 50/50 does so much right that I can forgive those lapses. It offers a lighter than usual take on a serious topic that manages to become amusing and moving at the same time. 50/50 appears in an aspect ratio of approximately 1.78:1 on this Blu-Ray Disc. Though not stellar, the transfer was always good. The film went with a subdued palette that tended toward a somewhat airy, blown-out look. Though it lacked a lot of peppy hues, the presentation seemed fine, as the colors worked well within the flick’s design. Blacks seemed dark and tight, and shadows demonstrated good clarity. Though this wasn’t a great transfer, it was strong enough for a “B”. The DTS-HD MA 5.1 audio of 50/50 deliver something pretty typical for a character-based comedy. This was a chatty flick that lacked any significant “showy” sequences. Stereo music and general ambience ruled the day. These gave us a decent sense of place but rarely much more; only some club scenes opened up the mix to any notable degree, and those were brief. Audio quality satisfied. Music was full and rich, while effects showed nice clarity and accuracy. Speech – obviously an important factor here – appeared concise and crisp. Nothing here soared, but it all seemed acceptable. We get a mix of extras here, and these launch with an audio commentary from actor/producer Seth Rogen, director Jonathan Levine, producers Evan Goldberg and Ben Karlin, and writer Will Reiser. All three sit together for this running, screen-specific look at the flick’s origins and autobiographical elements, cast and performances, editing and music, sets and locations, and a few other elements. Don’t expect to learn a ton from this commentary, as it provides more of a bull session among the guys than a fact-packed program. We do learn a decent amount about the production, but we just don’t get a ton of material, and that can disappoint; in particular, I’d have liked more info about Reiser’s real-life experiences. Still, even without a lot of depth and detail, this is an enjoyable piece. The various guys mesh well and make it a fun chat from start to finish. While I’d like more information and less clowning, it remains a good enough combination of those two sides to merit a listen. 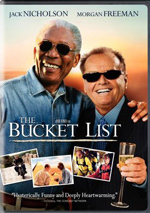 Five Deleted Scenes run a total of six minutes, 17 seconds including a quick intro from Levine. These include “Mom Wants a Third Option” (0:59), “Lentil Nut Loaf” (0:54), “Adam Returns to SPR” (1:42), “Alan Gives Adam His Ties” (1:27), and “Adam Collapses on the Street” (1:09). The last one allegedly offers a darker alternate ending, but it’s pretty clear it was actually shot as a joke. As for the others, they’re reasonably interesting, if not vital. They give us additional glimpses of a few supporting characters and are perfectly solid in their own right. Any of them could’ve made the final cut and been fine in the film. We can view these with or without commentary from Levine. He delivers some thoughts about the scenes and why he cut them. Levine delivers a nice take on the sequences and covers them well. A few featurettes ensue. The Story of 50/50 goes for seven minutes, 54 seconds and includes notes from Reiser, Rogen, Goldberg, Levine, director of photography Terry Stacey, still photographer Chris Helcermanas-Benge, camera trainee Michael Sharkey, B camera 2nd AC Adriene Wise, assistant location manager Rico Mielnicki, and actor Joseph Gordon-Levitt. “Story” examines the real-life roots of the project, what Levine brought to the table, the film’s dog, and some of the crew’s experiences with cancer. It’s a broad featurette and not an especially detailed one, but it moves quickly and offers enough meat to merit a look. Under Life Inspires Art, we get four segments with a total running time of nine minutes, 15 seconds. We get some notes from Reiser, Goldberg, Rogen, and Gordon-Levitt. Each of these take us to various sets and give us more notes about the real-life experiences Reiser and the others went through when he battled cancer. The clips tend to be brief and fluffy, but they throw in interesting notes about Reiser’s life. Finally, Seek and Destroy lasts two minutes, 21 seconds. It delivers remarks from Rogen and shows the shooting of the scene in which Adam and Kyle ruin a painting. “Destroy” follows the same template as the “Life Inspires Art” snippets, though it’s not as informative. Still, it’s a fun little piece. The disc opens with ads for Man on a Ledge and The Darkest Hour. No trailer for 50/50 appears here. With its combination of comedy and drama, 50/50 hits a good balance. It throws in enough humor to counteract the seriousness, and vice versa. Add a good cast and we get a likable, involving tale. The Blu-ray delivers decent to good picture and audio along with a reasonably interesting set of supplements. 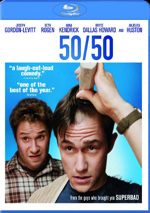 Chalk up 50/50 as an effective comedy/drama.